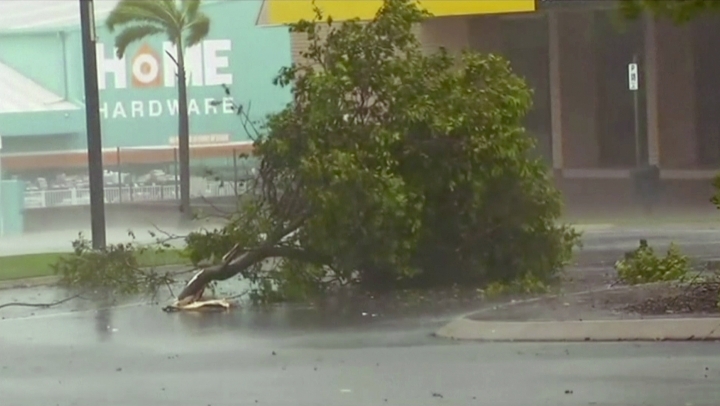 TOWNSVILLE, Australia — A powerful cyclone slammed into Australia's tropical northeast coast on Tuesday, tearing down fences, snapping trees and knocking out power to thousands, officials said. The destructive eyewall of Cyclone Debbie, a Category 4 storm packing winds up to 260 kilometers per hour (160 miles per hour), made landfall near Airlie Beach, a resort town in Queensland state, the Australian Bureau of Meteorology said in a statement. The town is a jumping-off point for the Whitsunday Islands, a popular tourist destination that has been pummeled by fierce winds that damaged roofs and knocked down palm trees. Officials warned that the slow-moving storm was likely to hover over the region for several hours before weakening as it moved inland. 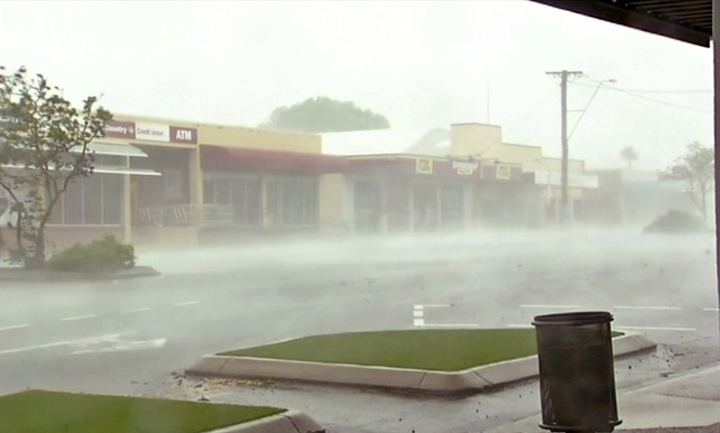 Queensland Police Commissioner Ian Stewart said the cyclone's glacial pace had created a "battering ram effect," with some areas enduring the howling winds and drenching rains for a punishingly long time. Communities along more than 300 kilometers (200 miles) of coastline were expected to be impacted, he said. "I suspect before the day is out, we will see a lot of structural damage in the cyclone's path," Stewart said. John Collins, a member of the Whitsundays government council, was sheltering from the storm with his wife and four daughters inside their house in Proserpine, a town south of Airlie Beach. He could see that four of his neighbors' sheds had been destroyed and every house within eyesight — including his own — had lost their fences. At least four trees had been smashed to pieces. Thousands of people evacuated low-lying areas in the storm's path on Monday. Hundreds of schools were closed on Tuesday and more than 20,000 households were without power by mid-afternoon. Whitsundays Regional Council Mayor Andrew Willcox said authorities had received 98 requests for help and had responded to most of them. The storm also poses a serious threat to the farming region's crops. The area produces a wide range of fruits and vegetables, including tomatoes, mangoes and peppers.